I have met some die-hard Lectrosonics fans over the years, but I personally have little experience using their gear. I thought this might be good for this review, as I didn’t have any preconceived notions about what to expect. Sure enough, that turned out to be the case. My first exposure to the Duet in-ear monitoring system was at AES in October of 2017. Lectrosonics kindly allowed me to take a bodypack receiver and walk the entire show floor, miraculously with very few dropouts. In fact, I really had to try to get the pack to drop out. Mind you, this was in the heart of New York City and on the show floor of an audio convention — a.k.a. the wild west of RF. Thanks to the antenna diversity switching receiver design, the RF signal stayed stable even when I was a long way from the transmitter. This was the limited experience I had with Duet going into this review. The Duet system consists of two main components — the M2T half rackspace transmitter and the M2R diversity switching bodypack receiver. The very first word that came to mind as I unwrapped the transmitter and receiver was…robust. In typical Lectrosonics fashion, this equipment is built like a tank. I could take this stuff into battle. If you are a long-time Lectrosonics user, I’m not telling you anything you don’t already know. But if you’re new to Lectrosonics, let me just say this again. This gear feels sturdier than anything else on the market. When you hold the receiver pack in your hand, you know that it can withstand some serious abuse. That is incredibly important when choosing an in-ear monitoring system, especially for a touring act. The half rack M2T Transmitter is a dual stereo unit with a tuning range of 470 MHz to 608 MHz. Two M2T’s racked side by side provide four stereo IEM transmitters in just 1U. Alternatively, a single M2T could be used to feed four mono IFB mixes, making the unit highly flexible for touring, theater and broadcast applications. The front panel of the M2T has buttons for navigating the menu structure, which are well laid out and easy to manipulate. Also on the front panel is the main power switch, a USB port for connecting to a computer, an IR port for synchronizing with an M2R bodypack receiver, and a 1/8” headphone jack for monitoring. The rear panel has inputs for both stereo transmitter channels, with four XLR combo jacks for analog input and dual RJ45 connections for Dante input over the network, a handy feature for users that have an already established Dante network. In addition to the audio inputs, the backside has a separate RJ-45 for networking the receiver with Lectrosonics’ Wireless Designer software, a pair of BNC antenna connections, and a power inlet to connect the external power supply. While an internal power supply would have been a nice addition, fitting one inside a half-rackspace chassis with this transmitter density would have probably been a challenge. If you are creating a large rack of M2T’s, you can use an antenna combiner with DC outputs to eliminate the clutter of a bunch of external power supplies in the rack. Lectrosonics does recommend using the highest quality combiner available, as less expensive units do not fare well with the digital transmission signal. The M2R bodypack receiver is built for the rigors of the road. The front of the receiver has a high-resolution LCD screen, which makes for a really nice experience when working with the menus and taking scans. The M2R has the same four navigation buttons as the M2T, making for a seamless menu experience on either piece of hardware. The M2R has all of the features you’d expect on any high-end IEM bodypack such as volume, L/R balance, HF boost, and a limiter. In addition, there are some unique and powerful features such as SmartTune and FlexList. SmartTune scans the M2R’s tuning range and automatically chooses a frequency with the lowest RF interference, making for quick and easy deployments without using a computer. The FlexList feature allows the M2R to store profiles from up to 16 performer’s IEM packs. This is not your basic engineer mode that you find on other systems. The FlexList stores 16 performer’s mixes by name, but also includes their frequency, mixer and limiter settings, so the engineer can toggle through mixes and hear exactly what their artists are hearing on stage. Wireless Designer includes monitoring of RF and audio monitoring of both channels. Wireless Designer software is used to manage, monitor and control every aspect of a wireless deployment using Lectrosonics equipment. I’m a Mac user, so I was happy to see that they did have a OSX version of their software. However, Wireless Designer is a Microsoft Silverlight application. I am not a software developer, nor do I pretend to know the details of developing software for multiple operating systems. As an end user, the installation of Wireless Designer on my MacBook Pro was less than elegant. It required downloading a particular version of Firefox, which would then allow me to install Silverlight, which would then allow me to install Wireless Designer. All of that said, once installed, the software ran smoothly. The M2T can be connected to a computer running Wireless Designer using USB or over an Ethernet network. I opted to connect via Ethernet as I already had a small Dante network up and running with the unit. I did run into one small problem trying to connect to the M2T. Wireless Designer doesn’t seem to have an option to choose which network interface you are using to connect to the hardware. I had both my Wi-Fi network and my hardwired network running at the same time, and Wireless Designer couldn’t seem to find the M2T on the network. After a bit of troubleshooting, I tried turning off my computer’s Wi-Fi and sure enough, the software found the M2T on the wired network right away. A useful frequency scan function is also built into Wireless Designer. Now that I was up and running, I found the software to be seamless and easy to manage. I ran an RF scan on the M2R receiver, and using the IR sync feature, synced the scan data over to the M2T transmitter, which them immediately appeared in the Wireless Designer interface. One of the great benefits of this scan method is that the M2R receiver can scan all the way from 470 MHz to 614 MHz, providing scan data for a wide swath of the UHF spectrum. Once the scan data was in Wireless Designer, I was able to run a coordination and deploy frequencies to the M2T within seconds. Once I had the Duet system up and running with frequencies deployed to the transmitters and receivers, I was able to really listen to the system in action. Duet is a 24-bit digital audio wireless system without companding or any of the artifacts associated with traditional FM modulation. The system has exceptional clarity, detail and stereo imaging. I found that I really liked the sound of the M2R with a +3 dB boost at 7k Hz applied. The HF boost is a feature I rarely use on other systems, but it allowed me to listen at a slightly lower level overall and still maintain the presence I was looking for in the high frequencies. I also soon noticed that the M2R gets loud… really loud. The 250 mW headphone amplifier provided me with more than enough level. When I drove the transmitter properly, I could barely get the pack past 50 percent volume without needing to back it down. On other IEM systems, I have found myself wishing the packs could get louder, but I am certain this would never be the case with Duet. Overall, the Duet is a world-class wireless in-ear monitoring system, on par with the best products on the market. If you are considering a new wireless IEM system, Duet should definitely be on your list as a consideration. 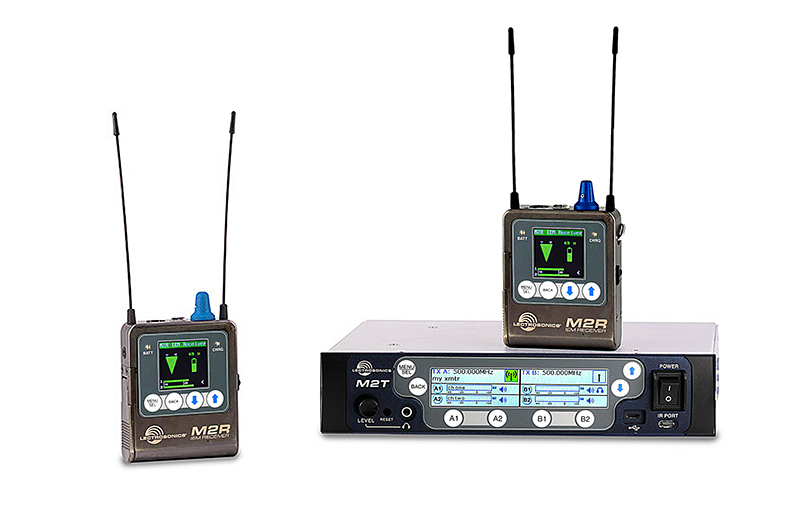 Wireless mic specialists Lectrosonics enters the IEM hardware market with a rugged, two-channel system that combines reliable RF operation with impeccable audio performance. Latency: Analog inputs: 1.4 ms; Dante: 1.0 ms plus Dante network.